Tomorrow morning as a part of our continuing information-education segment of CSL's Legislative Committee discussion, we will have a fourth segment on the state budgeting process. We will be using slides, so be sure to use your ZOOM link so that you may see them. Call in or attend in person. 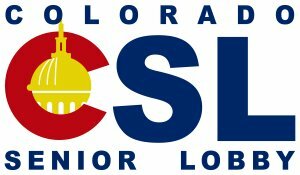 The Colorado Senior Lobby Legislative Committee Meetings are generally held every Monday while the legislature is in session. Please let us know if you plan to attend in person as space is limited – call 303-832-4535. The telecommunications issues should be corrected now and we have a more robust Internet connection. Please use the Zoom system - either calling in or the Zoom video conferencing. Numbers are shown below. Dial in with Zoom: 1-720-707-2699. This background is from CCLP: “As many Coloradans struggle to keep up with the rising cost of housing, any financial relief would be welcome. HB 1245 would increase funding for affordable housing by imposing a $1,000 cap on the amount of sales tax revenue Colorado’s very largest retailers can keep as their 'fee' for collecting the tax. The additional sales tax revenue would be transferred to the housing development grant fund within the Department of Local Affairs, which would be used to improve, preserve, or expand the supply of affordable housing in Colorado. The change in how the sales tax vendor fee is administered would result in roughly $23 million being invested in housing across Colorado in the first year and $45 million to $50 million per year thereafter." This will be discussed on Monday as well; it is scheduled for hearing on Friday of next week and so we will be voting to take a position on Monday. CCLP (Colorado Center on Law and Policy) has drafted a proposed bill to add an additional $40 million per year into affordable housing by drawing from the surplus in the Colorado Unclaimed Property fund. Please see attached. Clair Levy, Executive Director of CCLP, will be in attendance to explain. To balance that, please see these two links that dive into some of the opposition of the bill. 4 Any other new bills or other bills coming up for vote this week. New location at First Baptist Church! Why Attend? Meet legislators, elected officials, Senior Day Sponsors, learn about what is coming for older Coloradans in the next decade and potential impact on future legislation. Nearly 25% of the People of Colorado are over the age of 60 – together we can become a BOOMING voice. CSL – with you on board works to improve the health and well-being of Colorado’s older adults. Become a participant in the policies impacting your life. We will be live streaming Senior Day at the Capitol starting at 9AM on our YouTube channel. NOTE: the Program schedule is a work in progress and will be completed later this week. ﻿Colorado Senior Lobby is working with the Colorado Association of Area Agencies on Aging (c4a) to produce and distribute informative flyers that review the work Area Agencies on Aging (AAAs) do to serve older adults in Colorado. These flyers will be distributed to Colorado Legislators every other week with the assistance of Representative Jonathan Singer (D) – District 11, Boulder County and Senator Nancy Todd, (D) – District 28, Arapahoe County. Thank you for your time in reviewing information about the CSL Legislative Committee Meetings. Do not hesitate to call or email Colorado Senior Lobby with questions.